A public competitive solicitation will be issued inviting innovators from the for-profit and non-profit sectors to apply for support through the MA. The solicitation will describe the Program’s goals and sectors of focus, along with detailed application instructions, requirements, timelines, selection procedures, award criteria, and other relevant information. All applicants are encouraged to thoroughly read through the solicitation document before filling in the form. These roadshows will involve executing innovative strategies to capture the best innovations in these sectors across the linguistic and cultural diversity that exist across the country. Interested innovators will be invited to apply to participate in the program. Interested applicants must first submit an application Form. All Application Form submissions must be made through an online application form provided at www.millenniumalliace.in. As requested in the Application Form, applicants should describe the purpose of the project, summarize the project’s goals, innovation, sustainability, additionality etc and include financial information for the project among other criteria in the application Form. Attachments to the Application Form will not be reviewed. If MA finds the project proposed in the Application Form to be responsive to the selection criteria, then the applicant will be invited for a pitch session. An invitation for Pitch in does not constitute intent to award. Page limits beyond the specified limits listed on the Full Application may not be considered. Citations should be provided whenever possible, and assumptions used to generate estimates should be clearly explained. MA bears no responsibility for data errors or omissions. MA may accept applications past the deadline due to transmission difficulties that are not the fault of, or within the control of, the applicant with the approval MA founding partners. MA is not responsible for any costs incurred in preparing the Application Form or otherwise participating in the MA competition for funding. Sectoral Evaluation Committees will be established to (comprising of experts the) screen all applications within a particular sector. FICCI will identify a Committee Chairperson for each Evaluation Committee, who will manage the virtual and in-person evaluation process of the Application Forms. The same evaluation committee with a Chairperson will convene and moderate a review session with all committee members and coordinate a fair and consistent review process. 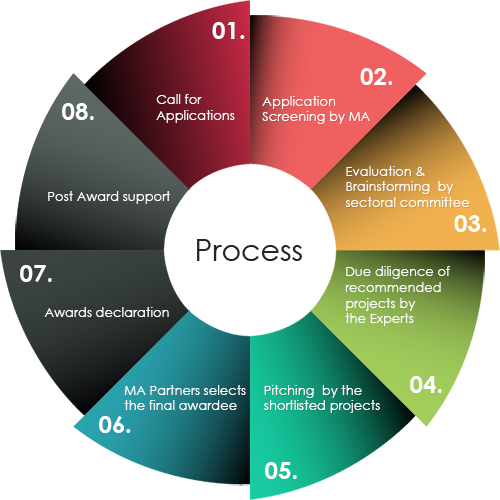 Each committee member will independently read every application and score them against the MA evaluation criteria, providing narrative on the strengths and weaknesses of each application to justify their scoring. All members will be expected to participate in person in a closed review session coordinated by FICCI. After independent review/scoring, the Chairperson will convene an evaluation committee meeting during which members will reach a consensus on a final score and rank applications. Each evaluation committee will provide FICCI with their rank order of applications that they recommend for funding. Recommendation by the Evaluation Committee does not necessarily and automatically qualify an applicant for the MA Awards. The Awards will be based on the due diligence conducted and the recommendations of the MA Apex Committee. FICCI shall call for the pitching session of the shortlisted applicants as decided by each sectoral committee, the applicants shall be given an opportunity to present their project to the selection board comprising of the MA Strategic Adviosry Board, MA Partners as well as independent External Experts. Based on the Pitching session’s results, a further down selection of applications will take place. For these shortlisted enterprises, a team of experts will undertake an onsite due diligence. Post Due diligence the Selection Board shall again meet to decide the final list of awardees. The final list of awardees will be published on the MA website. The awardee would be supported on various fronts – capacity building, Mentoring, Portfolio Management, leveraging from the existing networks and liaison to various organization, GOI and platform and connect for expansion to south south countries. The intervention will improve BOP lives in a substantial way. The enterprise intends to use the MA grant in a catalytic way which takes their innovation and organization to the next level of scale. The project seems viable and would reasonable produce the projected impact. The project plan (based on the log frame) holds together. The second stage of evaluation is done against Section 2 of the application. The shortlisted applications in each sector qualifying from the first stage of evaluation are passed on to sector-specific committees for review. The committee comprises of 3-5 experts, including sectoral experts, development experts, technical and financial experts. FICCI identifies a committee chairperson for each evaluation committee, who manages the virtual and in-person evaluation process. The chairperson convenes and moderates a review session with all committee members and coordinate a fair and consistent review process. For every sector, each committee member reviews and evaluates the applications using an online evaluation tool. The members score the applications against the MA evaluation criteria, also providing narrative on the strengths and weaknesses of each application to justify their scoring. Subsequently, brainstorming sessions are conducted for each committee to create a shortlist of the 10-15 applications in each sector. These applications move on to the stage of pitching by innovators. Innovation: The intervention brings an unprecedented solution to the BOP and improves substantially on any existing solutions to the problem. Financial Sustainability: The enterprise has a viable plan for sustainability post the MA grant, which is not grant based. Project Scalability: The potential for this innovation to scale up successfully and expand their reach is great. Social Impact and Monitoring: The project has strong M&E processes in place with clear and reasonable indicators. Project Execution: The project plan is clear and achievable, and will reasonably lead to the projected outcomes. The applicant is aware of the risks and challenges and is equipped to mitigate these risks. Team: The team is sufficiently staffed (number of team members, their roles) and the necessary skills to achieve the desired impact are accounted for within the team. MA Additionality: Millennium Alliance is able to contribute uniquely to this project. Global (only for applicants who apply for global window): The applicant has demonstrated the need for their innovation in the new country and has the know-how to replicate abroad. Innovators are invited for a pitching session held in New Delhi. The innovators are provided a ten minutes slot to make a presentation to the jury comprising of subject matter experts and MA program partners. The ten minutes presentation is followed by a ten minutes Q/A. Applicants are provided the presentation template well in advance to help them prepare for the pitching session. Due Diligence is conducted for shortlisted applicants in each sector. An expert shall visit the headquarters of the organization and/or the project site to cross check the information provided in the application form. The expert will also have an in-depth conversation with the innovator to understand the innovation, development status, business model and the intended impact. Prior to this visit, the applicant is asked to complete a self-reporting template and to provide documents related to the following parameters: organization structure, management and operating systems, financial reports, accounting practices, and FCRA account details. The expert will also review these documents with the innovator during the visit. Based on the pitching session feedback and the reports from the onsite due diligence visits, the MA partners would make a final decision on the innovations to be awarded in each sector. The awards are presented to the innovators in a public award function recognizing their work. Subsequent to the awards ceremony, the award agreement is signed with the innovators and the first tranche of funds is released.